Moo CPU uses FLTK 1.3.3 (C) 1996-2016 - Bill Spitzak and others. Moo CPU is a simplified CPU simulator with a built-in assembler for the very fictional MOO Cpu Assembly language. It is intended to be an aid in learning the basics of assembly language and the basics of computer operation "under-the-hood." Bits is a simple converter between binary, hexadecimal, and decimal number formats. The download includes both programs for both Windows and Linux. All CPUs execute instructions. These very simple instructions are called "machine language". They are entirely numeric and are not human readable (by normal humans). The source code to produce machine language is called "assembly language". Assembly is human readable (just barely). It "assembles" into machine language with a one-for-one correspondence between an assembly language instruction and a machine language instruction. Higher level languages compile on instruction to many machine language instructions. A CPU starts reading memory at an address and finds a machine language instructon. Following the instruction, there are often several bytes of parameters for that instruction. As the CPU executes the instruction, it advances a special register, (a tiny amount of memory built onto the chip) called a program counter, to "point at" the memory being read and interpreted. Typical machine language instructions include moving a value from memory to a general purpose register or back, doing math on values in memory or in registers, making comparisons between memory and registers, or affecting the program counter to read and execute a different portion of memory. indirect mode - The address or register after the instruction holds the address used to find the value. The syntax of the assembly langauge is used to specify the instruction and its addressing mode. Different chips, and different assemblers, often use differing syntaxes to specify the same addressing modes. The Moo CPU emulator emulates in software a completely fictional CPU. The Moo CPU uses a very basic machine language with only 42 instructions. These instructions are intended to be typical of those used by a very simple CPU. The purpose of the emulator is to teach programmers already familiar with higher level languages the basics of assembly language and CPU operation. The Moo CPU has 8 general purpose registers and 8 floating point registers. It has also has a stack pointer and a program counter. 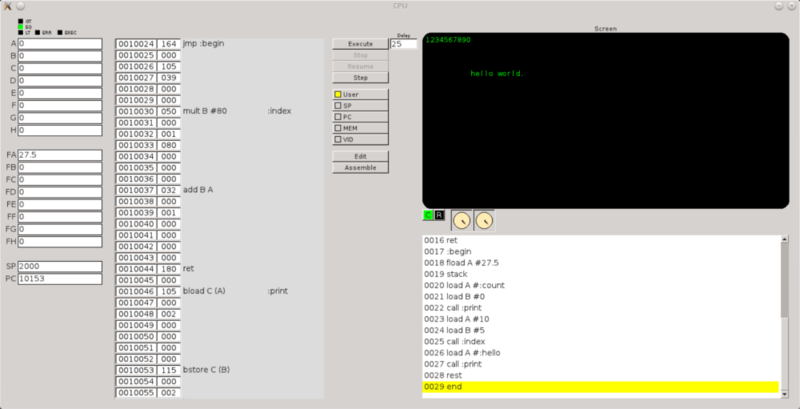 The registers are labeled A though H. The stack pointer is labeled "SP" and the program counter is labeled "CP". All of the registers, including the stack pointer and the program counter are 32 bit. The parentheses around "C" indicate that the add instruction should get the address out of C, then get the value to be added in from that address, leaving the result in register B. Most of the instructions operate on full integers (32-bits, 4 bytes). Some instructions are duplicated to work on single bytes or on the floating point numbers. This is indicated by a "B" or an "F" preceeding the instruction name. The built in assembler also supports a handful operations that specify how to assemble the source code, rather than resulting in machine language instructions. These include the ability to set a portion of memory to a constant ascii string, declare labels in place of addresses, and notate code with comments. The emulator also features 1 megabyte of main memory, which includes 2,000 bytes of video memory (addresses 0 - 1999) and 8,000 bytes of dedicated stack memory (addresses 2000-9999). The remaining memory (addresses 10000 - 1048575) is reserved for the user's program. The emulator includes a 80 column by 25 row ASCII based "video screen", and a simple text editor for loading, saving, and assembling Moo CPU source code. add B A               ; add the A register into B to produce "address = (Y * 8) + X"
:print                ; label the print subroutine. The address of the string is in A. The address at which to print is in B. The user interface is divided into several sections. In the upper left corner is the "CPU Status" section. This section has "lights" indicating different CPU conditions. The "GT", "EQ", and "LT" lights indicate if the last comparison operation resulted in the number being less than, equal to, or greater than the compared number. The "ERR" light indicated that the CPU experienced a runtime failure and has stopped. The "Exec" light indicates that the CPU is executing a single instruction. Because this CPU runs in slow motion, this light will flicker on and off while the program is executing. The register section displays the values in the 18 registers. The first 8 registers are general purpose registers that can only hold 32 bit integers. They are labeled "A" through "H". The next 8 registers are floating point registers. These can only hold 32 bit floating point numbers. Unlike the general purpose registers, these can not be used for indirect addressing. They are labeled "FA" through "FH". Note: while these are labeled with a leading "F", when referenced in Moo assembly language the leading "F" is omitted. The "SP" element shows the current value of the stack pointer. The "PC" element shows the current value of the program counter. This is the address in memory of the currently executing CPU instruction. All of the register fields are read-only and do not allow user editing. The memory view panel shows the memory of the pretend computer. It is divided into four columns. 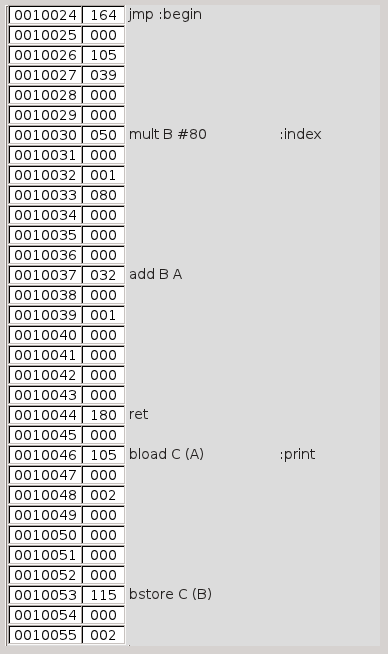 The first column displays the memory address, labeled from 0 to 1048575. The second column show the byte value at that memory address. The third and fourth columns show the source value of any instructions at that memory cell. The video memory is colored cyan. The stack memory is colored blue. Depending on mode, accessed memory will be highlighted in yellow. In SP, PC, MEM, and VID modes, the view will automatically scroll to show memory being accessed. When in USER mode, the view can be scrolled by clicking in the view and using the scrollbar, Page Up, Page Down, Home, and End keys. Page Up and Home scroll toward lower addresses. Page Down and End scroll toward higher addresses. The command buttons are the primary means of operating the Moo CPU. Edit - The Edit button brings up the simple text editor. From the text editor, you can load, save, edit, and assemble your Moo CPU assembly source code. This is typically the first button you will want to press. Assemble - The Assemble button assembles the source code into a machine language that the Moo CPU is able to execute. If successful, it also places the resulting program into the CPU's memory at address 10000 and creates the source view (see: Source View) with the execuatable source on numbered lines. Execute - The Execute button is inactive until a source program has been assembled. When pressed it executes the Moo program, waiting for the number of milliseconds specified in the "Delay" input next to the button. As the program is executed, depending on view mode, the memory will be highlighted and track activity, the registers will change, the source view will update and scroll, and lights in the status area may update. The program will continue to execute until it reaches an "end" instruction, or the user pressses the "Stop" button. Step - The Step button is inactive until a source program has been assembled. It is also inactive if a program is currently executing. This button allows the user to execute a program one instruction at a time. Stop - The Stop button is inactive unless a program is executing. It stops the program. The program can then be resumed where it was stopped using the Resume button. Resume - The Resume button is inactive until a running program has been stopped with the Stop button or the program has been stepped using the Step button. It continues running the program where it was stopped. User, SP, PC, MEM, VID - These buttons indicate the monitoring mode for the Memory View. The User mode allows the user to scroll the memory shown using the scrollbar, or the Page Up, Page Down, Home, and End key. The SP mode shows the memory dedicated to the stack and tracks memory accesses in the stack's range. The PC mode shows and tracks the memory address in the program counter. This is the address of the currently executing instruction. The MEM mode tracks the last memory address to be read or written by the CPU. The VID mode shows and tracks memory accesses in the portion of memory dedicated to the video screen. The screen shows the memory from 0 to 1999. It is 80 columns by 25 rows. The bytes in that memory range are interpreted as ASCII and displayed on the screen in a position corresponding to that memory address, starting with the top left corner. So, memory 0 throgh 79 would be the first row. Memory 80 through 159 would be the second row. Etc. Placing 65 in memory 1000, would put a capital "A" (ASCII 65) in the center of the screen. The screen has some silly controls along the bottom edge. The first is a button labeled "C". This cycles the text color between green, amber and white. The next button, labeled "R", toggles the screen between normal and reverse mode. In reverse mode the background (usually black) gets the text color and the text becomes black. There are two knobs. The leftmost controls brightness. The other controls contrast. The source view shows the source code that resulted in executable machine language after it has been assembled. The line that is currently executing is shown and highlighted, otherwise the view scrolls using the scrollbar or navigation keystrokes. Source code that does not result in executable code (constants, labels, and comments) is not shown. load Integer Load load reg addr Loads an integer value from addr to reg. bload Byte Load bload reg addr Loads a byte value from addr to reg. fload Floating Point Load fload reg addr Loads a floating point value from addr to reg. store Integer Store store reg addr Stores an integer value from reg to addr. bstore Byte Store bstore reg addr Stores a byte value from reg to addr. fstore Floating Point Store fstore reg addr Stores a floating point value from reg to addr. add Integer Addition add reg addr Adds the integer value at addr to the value in reg, leaving the result in reg. fadd Floating Point Addition fadd reg addr Adds the floating point value at addr to the value in reg, leaving the result in reg. sub Integer Subtraction sub reg addr Subtracts the integer value at addr from the value in reg, leaving the result in reg. fsub Floating Point Subtraction fsub reg addr Subtracts the floating point value at addr from the value in reg, leaving the result in reg. mult Integer Multiplication mult reg addr Multiplies the integer value at addr with the value in reg, leaving the result in reg. fmult Floating Point Multiplication fmult reg addr Multiplies the floating point value at addr with the value in reg, leaving the result in reg. div Integer Division div reg addr Divides the integer value in reg by the value at addr, leaving the result in reg. fdiv Floating Point Division fdiv reg addr Divides the floating point value in reg by the value at addr, leaving the result in reg. mod Integer Modulo mod reg addr Results in integer modulo of the reg by the value at addr, leaving the result in reg. cvt Integer Conversion to Float cvt reg addr Converts an integer value into a float value, leaving the result in a float register. fcvt Float Conversion to Integer fcvt reg addr Converts a float value into an integer value, leaving the result in a integer register. ifeq If Equal ifeq addr Sets the program counter (jumps) to addr if the comparison flag is set to EQ. iflt If Less Than iflt addr Sets the program counter (jumps) to addr if the comparison flag is set to LT.
ifgt If Greater Than ifgt addr Sets the program counter (jumps) to addr if the comparison flag is set to GT. ifne If Not Equal ifne addr Sets the program counter (jumps) to addr if the comparison flag is not set to EQ. push Integer Push push reg Pushes the integer value in reg onto the stack. bpush Byte Push bpush reg Pushes the byte value in reg onto the stack. fpush Floating Point Push fpush reg Pushes the floating point value in reg onto the stack. pop Integer Push pop reg Pops the top integer value off of the stack and places it in reg. bpop Byte Push bpop reg Pops the top byte value off of the stack and places it in reg. fpop Floating Point Push fpop reg Pops the top floating point value off of the stack and places it in reg. stack Stack Registers stack Pushes all of the registers, both integer and floating point, onto the stack to preserve them. stack Restore Registers rest Pops 8 floating point values and 8 integers off of the stack and places them in the corresponding registers. jmp Jump jmp addr Sets the program counter to addr, jumping control flow to that address. call Call Subroutine call addr Calls a subroutine by pushing the program counter onto the stack then setting the program counter to the address of the subroutine. ret Return from Subroutine ret Pops an addr from the stack and "returns" to that address. end End Program end Ends a program. This must be the last instruction in the program and must appear. exit Exit Program end Terminates execution of a program. This can appear anywhere in the program and is optional.
. Null Terminated String Constant .String Place a string constant in memory at the current address. String constants must appear at the start of the program, before any executable instructions. A label may appear before a string constant and that label may be used to refer to the address of the string. #B Byte Value #B 12 Place a byte value at the current assembling address. #I Integer Value #I 3271 Place an integer value at the current assembling address. #F Float Value #F 12.928 Place a float value at the current assembling address. : Address Label :Label Place a label at the address where it appears. Labels can then be used by other instructions to refer to that address. Labels should only contain alphanumeric characters, the underscore character, and the initial colon. ; Comment ;Comment Comments can appear either at the start of a line, or after an instruction and its arguments. The comment continues until the end of the line. # Immediate #Number Immediate addressing gets the value for the instruction from the number immediately following the pound sign. So, "load A #82" will load the integer 82 into the register A. Floating point instruction require that the number contain a decimal point, even if there is no fractional value. So, "fload B #37.0" will load the floating point value 37.0 into floating point register B.
A-H Register A-H Register addressing gets the value (integer or floating point depending on the operation) from the named register. There are 8 general purpose (integer) registers and 8 floating pointer registers, named in code as A, B, C, D, E, F, and G. So, "load A B" will load the value in B into A. Number Address 0-1048576 Address addressing gets the value from the memory address. The address can either be specified numerically (i.e. : "load A 20000") or can use a labeled address (i.e. : load A :MyAddress"). (...) Vector (addr) Vector addressing gets an address value from a register or an address and then gets the value at that address. So, "load A (B)" will get the memory address that is in register B, get the value from that address, and place that value in register A. "load A (20000)" will get the address that is in memory address 20000 and then get that value in that memory address and place it in register A.
SP Stack Pointer A-H Addresses the value in the special Stack Pointer integer register. This mode is read only and can be used to place the value of the stack pointer into a general purpose register. By doing so, a subroutine can stack its local variables, and then address their values without popping them off of the stack.